Nibs are pieces of dried raw cacao, which is chocolate in its simplest form, and before it’s mixed in with sugar, cocoa butter and milk. This means that when you eat a nib, you might be surprised by its bitter taste, its nothing like the taste of chocolate that we all know and crave. Eating chocolate in nib form, however, does have its benefits. Eating chocolate makes us feel good, this is because it releases neurotransmitters like serotonin and phenylethylamine in our bodies that promote feelings of well being, love and can even make us focus more. This therefore also means that cacao can lower blood pressure! Cacao is rich in minerals like Zinc, Copper and Manganese, and it has more antioxidants than red wine or green tea. When eaten in nib form, the antioxidants in Cacao can dissolve plaque build-up in the arteries for those suffering from heart disease. Eating chocolate bars with added sugars, fats and dairy dilutes the benefits of cacao so if you enjoy chocolate or are looking to try a new super-food, nibble on nibs! Dandelion Chocolate, based in the Dogpatch, comes to the Mission Community Market every week. Their representative Cynthia, loves to educate the public on all matters chocolate. She can talk to you about the process of making chocolate and most importantly, she has samples for you to try! To learn more about the benefits of nibs, go here. 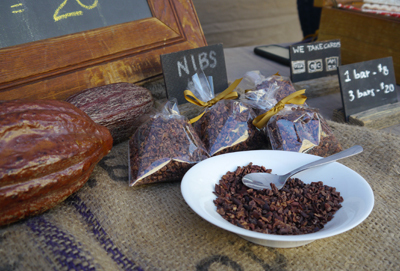 Otherwise, come try some nibs at the market this week and stay tuned for a recipe featuring nibs very soon!